Indoor Air Quality (IAQ) is essential to a healthy home in the winter. Dry air symptoms can include itchy skin, a dry nose, sore throats, the flu and can even affect hardwood flooring. AprilAire humidifiers are the equipment of choice for installation by Verne & Ellsworth Hann. 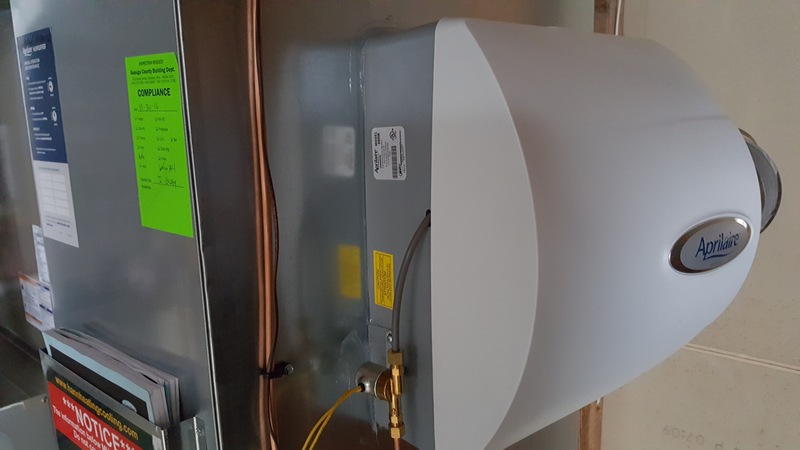 The photo above shows a humidifier mounted to a recent installation we completed for a customer in Geauga County. We also offer retrofit installations for systems that currently do not have home humidification. More people are becoming aware of IAQ issues within their home. Of course health is of paramount importance, but equally important is comfort and heating efficiency. Humidifiers help alleviate that static zap you get when a buildup of electricity is discharged between objects or people. This static electricity occurs when objects have an imbalance of negative and positive electrical charge. In dry air the imbalanced charges have nowhere to go. In humid air, this electricity is discharged harmlessly because moisture acts as a natural conductor allowing the charge to leave objects – and you! To be more specific about the health benefits consider that physiological passages from the nose the depths of the lungs are most functional when a room has a relative humidity level of between 40% to 60%. Mucus lined passages prevent pathogens from invading into deeper body tissues by constantly washing particles away. This critical defense mechanism is impaired by dry air, enabling harmful organisms to reach deep lung tissue and the blood stream. In conclusion, whether its for comfort or health, an AprilAire humidifier may be the best decision for yourself and your family. It may be the best homeopathic decision you can make. Whether you live in Cleveland Heights, Shaker Heights or any part of Northeast Ohio, give Verne & Ellsworth Hann a call to solve your home humidity issues. Stop living in a desert. Start living in a comfortable, healthy IAQ environment.